It’s always a nice thing, reviewing the past, while it’s snowing. Outside it’s quiet and peacefully white, even the clock seems be ticking slower. At once people don’t bother that they have to driver much slower, they are just happy, that they still can drive on the slippery roads. You know the gist of the cause, that’s what it‘s all about. 2017 has been quite a turbulent year with many changes within our company, but with much innovation too. There has been quite some employee turnover, as well as some big changes. We were very happy to introduce a lot of new products this year. We believe we’ve done it quite well, there was a small growth and we’re ready to start next year! 2018 announces itself in great state… with high expectations, locally, in Europe and in the rest of the world. Declaring Jerusalem the capital of Israel was quite a challenge for Trump. Should this be the start of the ending of world’s oldest conflict (as the Israeli like to call it) then we’ll have to adjust our expectations… we’ll see. The conjuncture seems good, stock exchange keeps increasing (without a reason? ), the unemployment decreases (together with more automation?) and investments increase (disposal of profit figures from the multinationals?). 2018 here we come! A year without challenges, won’t be a good one! And what about our oldtimers ? It’s funny that it is in everybody’s lips, whereas 30 years ago we were considered to be an outcast. My passion remains, for cars as well as for the job and the brand. I’m ready for the next 30 years, let’s start with the new year! I wish everybody a nice, pleasant and splashing 2018 with a lot of work, an exploding passion, much joy in your work in an excellent health, with much love and tenderness. it prevents your cargo from falling out down the road!
. a super nice combo we have all complete now, make sure to get yours! VW logos for the front and rear of your beloved T25/T3/Vanagon VW bus. Of course, all these VW logos are sold under the VW license program, so they are all been legal with regard to trademark and suchlike. Get rid of that play on your door hinges!! 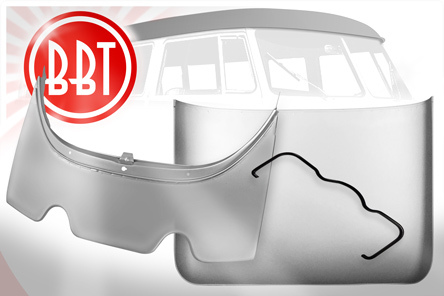 BBT delivers the door hing pin for your early bus (split window bus) in stainless steel. Top quality as youre used to get from BBT at a real decent price. Sold each! Vintage Speed released this classic quick shifter. It's a perfect shifter for any old speed bus! Lots of details and made with big eye for correctness and functioning. This shifter will shift your pride through modern traffic without any trouble! :) Bright your nights, BBT show you the lights! Finally the days of inferior quality indicator switches for late-model beetles are over!! Were so happy that we can offer the equivalent of an original SWF switch! This switch is as good as original and will serve you all day long! now available, original Bosch, straight from our stocks! Nothing beats new! You need this plug to cover the hole in your B-post and your doorstep when your Bay window is produced between 1970 and 1979. Now we've got the right pressing under sill for your 1955-1970 beetle in stock, perfect quality, perfect fit. Forget those incorrect cheap reproductions, BBT delivers quality first! These will fit perfectly on pre 55 cars, but the pressing is slightly different.
. loose batteries can cause a lot of trouble ; fire, or even explosion, you do not have an excuse anymore for a loose battery now that we have the clamp available! We missed one part of the B pillar in our line, so now we can supply the complete lower B post from our shelves! Complete roof for your splittie bus!!! Made in two parts and properly spot welded together this is THE part if you need a replacement roof. Very well packed in very strong card board box, ready to ship or deliver! We priced it very affordable to sell many!! Now available from our stocks! Now we have doglegs for all T1 and T2 buses available! This sill has a real good fit and will help to finish your restoration as it should! Type 4 engines suffer a lot from broken exhaust studs. Being two different sizes on one stud its not a common replacement part you can find easily. Therefore we teamed up and have these studs readily available from our stocks now. Made in high quality this is the stud that will replace your stock stud and bring your cylinder head back into a healthy condition, where you can mount your exhaust as it should without leaks. most of the existing brake calipers can be rebuilt with our new kit. Happy to have found a good solution for you! Secure and protect the ball joints of your T25/T3/Vanagon Bus like it should! We supply the correct brand new bolts to do so! We sell them by the pair! Replace your worn out hub with this brand new quality product. All spindles are slightly different and they all fit a very specific spindle washer! This washer keeps your bearings in place like it should, and at the same time adjusts the play on your front wheel bearings, (together with the nuts so to speak) so a good spindle washer is mandatory. This is our last addition to our spindle washer line, and we think we have the whole range covered now!
. worn out and tired, broken or missing, no problem any longer. We got you covered with these brand new ones! Fit all early bay window up July 1971. Replace yours when that transmission is open anyway, theyre fairly inexpensive! More Type 4 engines reach our shores and demand for Type 4 engine parts is on the rise. BBT tries to help our trusty customers by enlarging the range of Type 4 engine parts. These OE replacement hydraulic lifters are a nice add-on to our ever-growing type product line! We sell them in a set of 8 pieces. Stuff that almost any bus with type 4 engine needs, a brand new plastic mesh fan guard. Almost always broken or missing, its pretty important to keep big stuff out of our cooling system! Brand new and good quality available, we have them ready for delivery. We also added the wiper switch for your late bay window to our program. When our used parts dried up, it was time to find a reproduction. The quality seems OK and is fully functioning, that is why we change a broken part in the first place, right? Get those wipers back to work! we have the different sizes available now! Measure before ordering! 6 volts gas gauge for your bus. Originally stock from 63 to 67 but will fit of course in every dash from 55 to 67 when you're brave enough to drill that hole. Stop running out of gas, a fuel gauge is a luxury item that is easy to use. Key fobs, door mats and an espresso cup set, all with our beloved splittie prints!! We sell this official VW licensed cool accessories at very affordable prices. It's the perfect gift if youre invited to that BBQ of your crazy VW friends! #6710-001 Doormat "Retro Volkswagen logo"
#6710-002 Doormat "Samba & Beetle"
#6710-003 Doormat "Front & Back"
You will need these gaskets for your sliding window fastener during restoration or repair of your 55-67 split window bus. Made like original and they have a perfect fit!